A list of the most valuable oil paintings sold at auction, by Francis Bacon, William Orpen, Jack B Yeats, John Lavery, Louis le Brocquy, William Scott, James Barry, Roderic O'Conor, Walter Osborne and Frank O'Meara. by Irish painters, sold at auction. be complete without Francis Bacon. him to 3 paintings only. See below for a list of Irish artists who have achieved the highest sale prices at auction, plus details of some of their record-breaking paintings. With one exception, all prices are listed in the local currency of the auction house. See also: Art News Headlines. $86.3 million (Sotheby's, New York, May 14, 2008).  Study From Innocent X (1953). 2. Study From Innocent X. Francis Bacon. 3. Three Studies for a Self Portrait. For more, see: Francis Bacon: Biography and Paintings. With Riding Crop. By William Orpen. 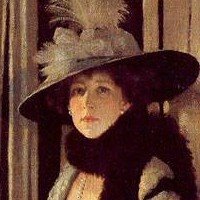 For more, see: William Orpen: Biography and Paintings. For more about famous portraiture, see: Irish Portrait Artists. for a painting in Ireland. 5. The Whistle of a Jacket. The greatest and most influential painter of Irish life and character, noted for his expressionist-style canvases and genre paintings. 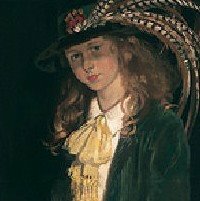 For more, see: Jack B Yeats: Biography and Paintings. For more about genre works, see: Irish Genre Painters. 6. The Bridge at Grez. 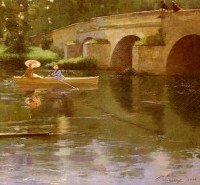 By John Lavery. painting by an Irish Artist. The leading Irish Impressionist, noted for his plein-air painting, especially his Continental works. For more, see: John Lavery: Biography and Paintings. See also our survey of Plein-Air Painting. 7. Travelling Woman with Newspaper. Ireland's greatest living visual artist, noted for his prolific creativity in numerous art forms including painting and tapestries. Note: In a private sale brokered by London art-dealers Agnew's in 2002, Louis Le Brocquy's masterpiece "A Family" (1951) was sold for £1.7 million. For more, see: Louis le Brocquy: Biography and Paintings. See also: Irish Exhibition of Living Art. 8. The Wild Ones. By Jack B Yeats. 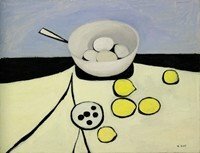 Outstanding Northern Ireland-based still life painter and semi-abstract artist. For more, see: William Scott: Biography and Artworks. For more about the still life genre, see: Still Life Painting. The most famous Irish artist of the 18th century, renowned for his grandiose history paintings executed in the classical style. 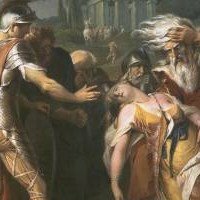 For more, see: James Barry: Biography and Paintings. For more about historical works, see: History Painting. 9. Bowl, Eggs and Lemons. Along with John Lavery and Walter Osborne, one of Ireland's most famous Impressionist-style painters of the Breton scene, including his iconic work "Breton Girl"; also noted for his colourist compositions and his lifelong love of France. For more, see: Roderic O'Conor: Biography and Paintings. For more about French Impressionist painting, see Impressionism Art. Technically, perhaps the most talented Irish plein-air Impressionist artist. Returned from the Continent to live in Dublin, but died young. 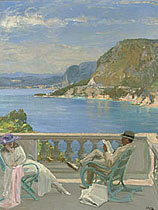 For more, see: Walter Frederick Osborne: Biography and Paintings. For details of plein-air Impressionists, see Impressionist Landscape Painting. Portrait of Mrs St George. William Orpen. Tragically short-lived, he is noted for his sensitive lyrical Impressionist-style landscapes which demonstrate his intense feel for light and colour. For more, see: Frank O'Meara: Biography and Paintings. For more about landscape art in Ireland, see: Irish Landscape Artists. Ireland's most famous contemporary abstract artist, noted for his monumental semi-geometric-style compositions. For more about non-representational painting, see: Abstract Art. For more about modern painters, see: Contemporary Irish Artists. Leading exponent of representational art in Ireland during the 1920s and 1930s, noted for his iconic images of the struggle for Independence. Irish-born portrait artist; one of the founder members of the Royal Academy in London. The most famous 'Irish landscape' artist, noted for his evocative 'sky, bog and turf' paintings of the West of Ireland. One of the leading indigenous Irish artists, noted for his meticulous genre paintings and portraits. One of the most famous artists of the 'Belfast school'. Largely self-taught, he is noted for his semi-expressionist figurative works. If you are interested in reading more about the sales of Ireland's best painters, please bookmark this page, as more auction results of valuable paintings will be added shortly.  For more details of top-priced paintings by Irish artists, see: Homepage.